U.S. President Donald Trump has arrived in Tokyo as part of the longest trip to Asia by an American president in more than a quarter of a century. Earlier, when visiting Hawaii, Trump and his wife Melania were draped with traditional necklaces after they arrived at Joint Base Hickam in Air force One. The president then met with Pacific Command leader, Admiral Harris, where it’s thought the situation in North Korea was discussed. 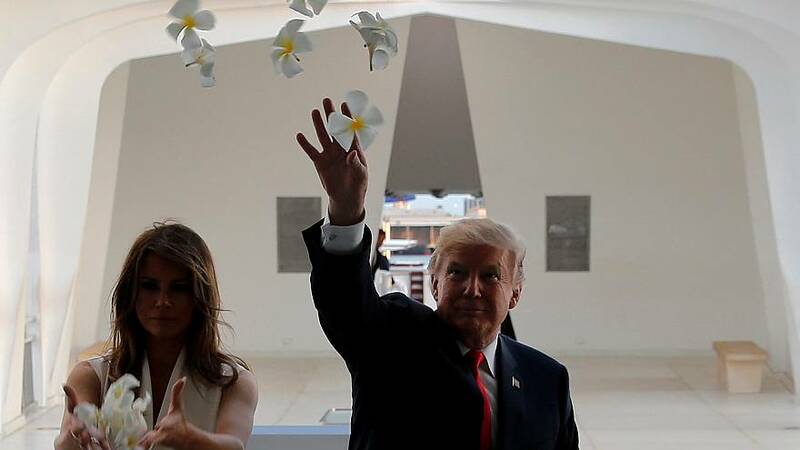 Later, Donald and Melania Trump visited Pearl Harbor and the USS Arizona memorial for the U.S. sailors killed when Japan bombed the naval base in December 1941. The trip to Asia will last twelve days and take in five countries. After visiting Japan he will meet leaders in South Korea. He’ll then move on to Beijing to try and persuade Chinese President Xi Jinping to get tougher with Pyongyang. The trip will also take in Vietnam and the Philippines.